Scott Creek 16 Basic shapes in one cast aluminum Die for 4" Round Extruders. Easy to adjust from one shape to the next. 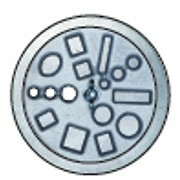 The Die can be altered with a small file to get unique shapes. Made in the U.S.A.